"It's what I've always wanted, to be a vet." Based on the best selling autobiographical novels of James Harriot, If Only They Could Talk and It Shouldn't Happen to a Vet, All Creatures Great And Small takes a look at life in rural England through the eyes of a young veterinary doctor. Set in the late 1930s and shot entirely on location in Yorkshire, director Claude Whatham captures the eccentricities of the people, and their reaction to the new vet in town. The books were later adapted to the long running TV series which was in production from 1977 to 1990. Simon Ward plays James Herriot, a city boy not long out of veterinary school. He leaves London for the Yorkshire hills, to apply for a position with the area's established veterinary practice, helmed by one Sigfried Farnon (a young Anthony Hopkins). Herriot must prove his worth, not only to his prospective employer, but especially to the locals who are untrusting of newcomers, and not welcome to change. The task is not an easy one, as Farnon has been serving these people for the past ten years. Every move Herriot makes is questioned, every diagnosis challenged. After his first successful trial Harriot is accepted into the practice, but he is soon to learn that his employer is a character unto himself, with his constant contradictions and changes of opinion. With the arrival of Sigfried's younger brother Tristan (Brian Stirner), a new dynamic emerges. Tristan has been studying at veterinary college, but his extracurricular activities have caused him to fail his exams. Tristan means well, but Sigfried is increasingly annoyed at his lack of progress, and of his nightly indulgences at the pub. While his visits to the clientele do introduce a number of peculiar characters, Harriot also is introduced to Helen Alderson (Lisa Harrow), a young farmer who lives with her father. Although there is some initial attraction, their relationship gets off on a rocky start after Herriot finds the nerve to ask her out. The intricasies of the characters are all played well, and the film gives a rich look at period life and the developing veterinarian practice moving into the modern age, in this true account of the real James Harriot's early life in Yorkshire. As someone who was a fan of the later TV series, it was somewhat alienating to have anyone other than Christopher Timothy (James Herriot), Robert Hardy (Siegfried Farnon), Peter Davison (Tristan Farnon) and Carol Drinkwater (Helen) in these roles. However, after the initial adjustment, I found the characters easy to accept in their characters. Ward plays his part with grace, and Hopkins is marvelous as Farnon, with a style not that dissimilar from a few of his later roles. The trials and tribulations of life as a vet are portrayed honestly, with realistic scenarios and the use of actual situations, such as the birthing of a foal. The effect isn't to glorify the profession, but to place it in context with its surroundings, and its place in the lifestyle. Subtly humorous at times, sorrowful at others, it is nonetheless an enriching experience, that would get my nod of approval, though I would still bear a more favorable affection to the TV version, but only due to more familiarity with those presentations of the characters. Image Transfer Review: Presented in its original 1.33:1 aspect ratio, the transfer is free of many anomalies. Film grain is evident, but well rendered. A few sequences appear slightly dark, and the film does have the earthy undertones to its coloring, which is typical of films of this vintage, and especially of this English origin. Colors are somewhat muted, but this adds to the rural feel of the film. The film has a slightly soft look to it, with no edge enhancement evident. Audio Transfer Review: Audio is two-channel mono, and is free of any annoyances other than a couple of low frequency anomalies caused by the on-location recordings. Dialogue is somewhat lacking in presence, again due to the live recordings. Hiss is not an issue, and overall the soundtrack works well with the picture. Extras Review: The film's 03m:36s theatrical trailer is the only on disc extra. The enclosed booklet has short biographies on Simon Ward, Lisa Harrow and Anthony Hopkins. 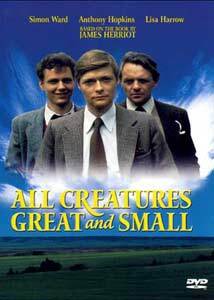 I quite enjoyed this version of All Creatures Great And Small, though it was at first a bit strange due to my familiarity with the later TV series. The essence of each character is well presented, and the situations are portrayed realistically. The period of the film is captured well, and there are certainly enough eccentric characters to keep one entertained. Recommended.